Geopolitical risks, Big Tobacco and earnings are top of mind for investors on Monday. 1. Smoker's widow ruling: Shares in tobacco giants Reynolds American (RAI) and Philip Morris International (PM) were falling heavily premarket after a Florida jury ordered R.J. Reynolds Tobacco to pay $23.6 billion to the widow of a long-time smoker who died of lung cancer. This is one of the largest awards against a tobacco firm, but the company is looking to avoid the massive payout. "We plan to file post-trial motions ... and are confident that the court will follow the law and not allow this runaway verdict to stand," said J. Jeffery Raborn, vice president and assistant general counsel for R. J. Reynolds. 2. Stocks slipping: The broader market was also looking weaker, with U.S. stock futures edging down Monday and most major global markets in the red. European markets were declining in early trading, with the benchmark Dax index in Germany sliding by 0.7%. Investors are still worrying about the fallout from the downing of Malaysian Airlines flight MH17 in eastern Ukraine. The main stock market in Russia was down by 1.4% as political leaders around the world call on Russian President Vladimir Putin to use his influence to end the conflict in eastern Ukraine. EU foreign ministers could decide to impose new sanctions on Russia as early as Tuesday. Markets are also keeping an eye on the intensifying conflict in the Middle East. Sunday was the deadliest day yet in the most recent bloody conflict between Israeli forces and Hamas. 3. Expect earnings: It's a big earnings week for the food industry. But up early Monday are Halliburton (HAL), Hasbro (HAS) and Allergan (AGN) with earnings before the opening bell. Netflix (NFLX), Crocs (CROX) and Chipotle (CMG) will report after the close. 4. Watch Arabtec, Tesco, Malaysia Airlines: Shares in Arabtec fell by nearly 10% in Dubai, before trimming their losses, as investors continue to worry about the future of the construction company. Shares in Tesco were rising in London after the company announced it was bringing in a new CEO. Malaysia Airlines stock staged a mild recovery Monday -- up 2.5% -- though the shares are still down by over 30% this year as two separate disasters raise questions about its ability to survive. 5. Friday market recap: U.S. stocks closed higher Friday. The Dow Jones Industrial Average rose 123 points and ended the week up by 0.9%. On Friday, it closed at its second highest point in history. 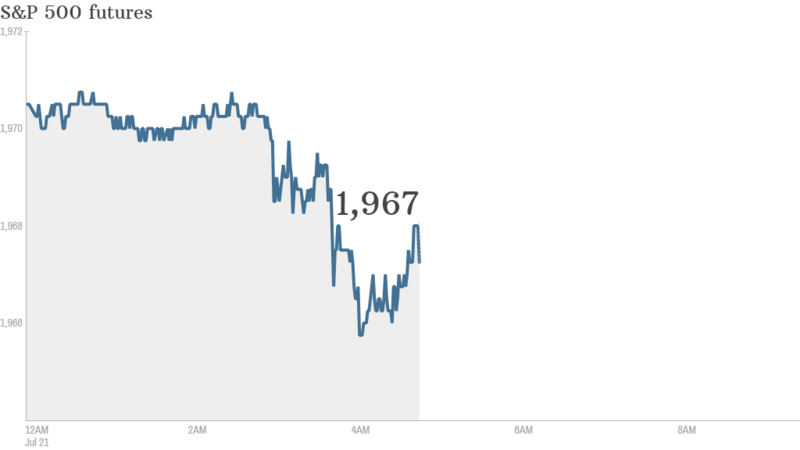 The S&P 500 moved 1% higher Friday and closed out the week with a gain of 0.5%. The Nasdaq rose by 1.6% Friday and also ended the week higher.